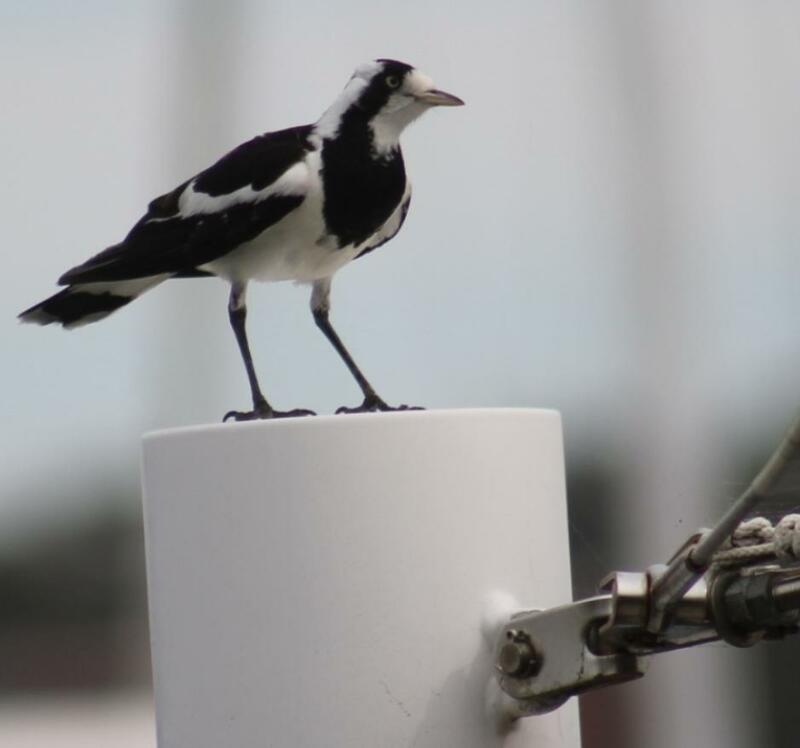 Along our creeks, on our green open spaces, and at most yacht clubs, this one having being taken at Royal Prince Alfred Yacht Club, where it seems to be a resident, are some of the most delightful small songbirds, the Magpie larks. Described in 1802 by ornithologist John Latham, and named by settlers due to their similarity to northern hemisphere magpies, the Magpie-lark (Grallina cyanoleuca) is an Australian bird of small to medium size, also known as the Mudlark in Victoria and Western Australia, the Murray Magpie in South Australia, and as the Peewee in New South Wales and Queensland. It was known as Yilimbirraa among the Yindjibarndi people of the central and western Pilbara and was called, by Port Jackson originals, ‘Karrook’. When first classified the Peewee was relegated to a subfamily of fantails in the family Dicruridae (drongos), but has been placed in a new family of Monarchidae (monarch flycatchers) since 2008. It is widespread in both in urban and rural areas, occupying all parts of Australia except for Tasmania and some of the inland desert in the far north-west of Western Australia. It is also found in southern New Guinea and Timor. Seasonal migrations; non-breeding and young birds form large nomadic flocks, sometimes consisting of several thousand individuals; mainly move north in autumn/winter and south in spring/summer. The magpie lark usually pairs for life, although ‘divorces’ are not unknown. Their nest is round, made of grass and other plant materials plastered together with mud. Breeding varies from August to February in the south, usually after rains. Both parents will incubate a clutch of 3-5 eggs. (1. )Magpie-larks are one of the 200-odd species of bird around the world that are known to sing in duet; each partner producing about one note a second, but a half-second apart, so that humans find it difficult to tell that there are actually two birds singing, not one. John Latham (27 June 1740 – 4 February 1837) was an English physician, naturalist and author. He was born in Eltham in South East London, and was the eldest son of John Latham (d.1788), a surgeon there, and his mother was a descendant of the Sothebys, in Yorkshire. Latham has been called the "grandfather" of Australian ornithology. He was able to examine specimens of Australian birds which reached England in the last twenty years of the 18th century, and was responsible for naming many of them. These included the Emu, Sulphur-crested Cockatoo, Wedge-tailed Eagle, Superb Lyrebird, Sociable Weaver and Australian Magpie. He was also the first to describe the Hyacinth Macaw. Latham practiced as a physician at Dartford in Kent, where he collected the Dartford Warbler. He retired in 1796 and settled in Hampshire. His main works were A General Synopsis of Birds (1781–1801) and General History of Birds (1821–1828). Dimensions: 30.9 x 21.1cm. Reference: Watling Drawing - no. 145. The drawing is annotated in ink at bottom, in varying hands and colours, " Natural size April - Native name Karrook, a rare Bird". from First Fleet Artwork Collection. London's Natural History Museum. Photos by A J Guesdon, 2012.